There are a million ways to learn to sing. But what’s the best way to learn to sing? And does it change throughout our lives? While everyone wants to learn to sing, it’s overwhelming to know where to start. So let’s talk about the best ways to learn how to sing better and specifically, how we need to learn to sing in different parts of our lives. The best way to learn to sing is to start from a young age. For a baby, the best environment to learn to sing is in one where your parents listen to music actively, and sing and keep rhythm (by patting) with you. In our early days, we learn to sing well from our parents. A mom holds her baby and sings while gently patting the baby on the back in time with the music. Even when an infant is non-verbal, they are picking up cues from their parents constantly. Sing and keep rhythm with your young children. And don’t worry if you don’t have a great voice or rhythm. The most important thing is that you make an effort! An infant will still be curious enough about the process of vocalization and how you’re making the noise of singing to try to imitate singing later. And imitation is a huge factor in learning to sing! Listening to kid-friendly music is another great supplement to singing and keeping rhythm with your child. There are lots of resources for children’s music that are simple and catchy. All that really matters is that you have lyrics, melody and rhythm. While the infant is still non-verbal, they get cues by watching others sing which helps them begin to audiate or visualize the sound as they sing. Many parents want their children to learn to sing but are hesitant about enrolling them in singing lessons too young. This is a totally fair concern especially if you don’t know if you have the financial ability to pay for private singing lessons. Also, in my experience most children younger than 7 don’t have the attention span or self-awareness that make private voice lessons a good investment. But that doesn’t mean that children shouldn’t be learning to sing under the age of 7. For children 2-7 years old, a group class environment is the best way to learn singing. That way, your child is learning to sing with children who are at the same level. The child is learning to experiment with their voice in a total judgement-free zone. Some other examples of a group music setting could be youth choir, school band, or even a group singing class. Children learn to sing on pitch by listening to others in a group environment. So the most important thing is the children feel free to experiment with their voices and teachers introduce basic music concepts like rhythm, melody, pitch, timbre and tone. Music is a social skill that brings people together and is developed gradually rather than being fixed. So if your child is learning to sing in lots of different ways without anything being “right” or “wrong”, they’ll be more open to trying lots of new things. If a child has been raised in a musical environment, by the time they’re seven years old their ability to sing on pitch and in tune is already quite developed. Even if they’re not singing in tune yet, they may not just have the vocal coordination to sing on pitch. So this is the age when a student can show a legitimate interest in learning to sing and voice lessons can start paying off big time! From the ages of 7 and up, the best way to learn to sing is to take singing lessons. At a younger age, imitating the sounds of others singing and following along was enough. But now that the student is developing their independent personality and voice, vocal technique must enter the picture. Learning to sing vibrato, or how to hit high notes are no longer intuitively understood and must be coached individually with each student to work with their unique voice. This is the real fun stuff for me, because as we grow up we also develop our own personalities as a singer. So vocal style, hitting high notes with power, and ear training become important ways to express ourselves. Singing lessons at this age are also the best way to learn to sing on pitch. If your child is having trouble with pitch in this age range, it’s important to note that this doesn’t mean they’re tone-deaf (has amusia). In fact, amusia is exceedingly rare. It just means that some additional attention needs to be paid to the pitch-perception (audiation) and pitch-making processes (phonation) of the student. Remember, the brain never stops developing its ability to find the best way to sing as long as the student continues training. The voice change during puberty is another important time to begin (or continue) vocal training. In the past, teachers believed that vocal training must stop during the voice change. However, studies show that voice lessons during adolescence can actually help the student learn to sing better and gain more confidence. I’ve seen it in plenty of my students. A male student comes in one week singing in the soprano register with ease and the next, he’s singing as a tenor with great difficulty. I’m very thankful that these students are coming to see me during this time because I’m able to help normalize the experience of where their voice is and what it can do on that day. Voice teachers of the past would just wish them luck and ask to see them in a few years. Thankfully, we now encourage students to take singing lessons during their voice change. And once the voice does begin to settle, the student emerges with all the knowledge and experience of the things we had been working on and understands their voice better. From the age of 7 until our 40s and 50s, our voice continues to evolve and develop. With the help of vocal training, we hope the voice has stabilized to the point where consciously thinking about pitch or breathing is no longer an issue and we continue to focus on singing smoothly through the different registers. After the age of 50 however, the voice begins to change again due to the influence of hormones and physiological factors. At this point it is absolutely crucial that you continue to use your voice frequently and are continuing to learn to sing better. I’ve written an article about learning to sing as we age and 3 ways to keep your voice young. In a nutshell, they all involve learning to incorporate singing into your everyday life so that you retain the fitness of the muscles and nerves that power great singing. Some of these activities include singing casually in your car or at home, joining a choir or getting the personalized attention of voice lessons. In the end, the best ways to learn singing are all deeply rooted in thinking in music. And in our youth, you can only do that by listening to lots of music and singers. By beginning with the mental process of hearing the notes, the student just has to ask the body to achieve that same note. The process of audiation and ear-training is much easier to learn in early life, which leads us to the hard part. But by the time our sense of pitch and rhythm are established, there needs to be a shift toward individual instruction so that each student can understand their voice and learn to sing the best they possibly can. From the ages of 7 and up, it is incredibly important the student receives individual instruction to help them learn to sing better so they understand what their own voice is capable of. We’ve also learned that during our adolescence and in later life, the best way to sing is to keep singing, preferably with private singing lessons that address your specific voice. 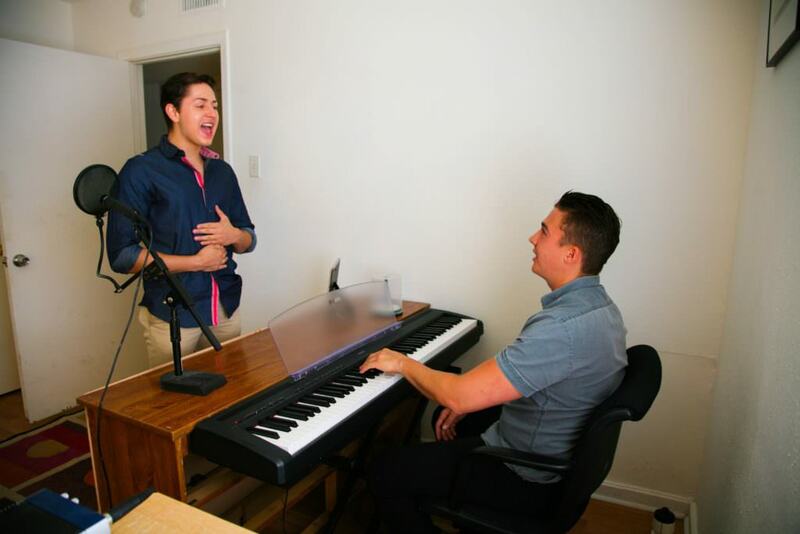 Voice lessons are available for students in Austin or Round Rock, TX or by Skype, worldwide.